Back in the 80's, a lot of people opposed Ronald Reagan's Strategic Defense Initiative. It's time we expand on it even further. It's time we put politics behind us, and do whatever it takes to insure the world is safe from nuclear weapons. The best way to do that is to expand on Ronald Reagan's SDI program, and make sure that any nuclear attack on the US, or ANY country can be PREVENTED. The End of Common Media? We no longer live in a Common Media World. Hundreds of years ago, news and information was spread through a very small number of media sources. Because of this, entire communities shared fundamentally the same news, at the same time. The news you read each day was identical to the news your friends, family and neighbors read. Until recently, whenever people talked about things they saw in the media, chances are they all saw the same media. Centuries ago, it was the local newspaper, and in the last century, it was a combination of print, TV and radio, but it was still limited to a small number, so the media was still essentially common. Each morning, the majority of people still heard, read, or saw the same news, at virtually the same time. It's becoming harder and harder to trust the news as it's reported these days. It's been said that 50% or more of what is reported in the news is either accurate or misinterpreted. Unfortunately, that figure is probably wrong. That's because it was something I read on a news site that most likely was inaccurate or misreported. Do you see the problem? The fact is, most news reporters today get their information from other sources in an endless cycle of smaller sources being quoted by larger ones, until you eventually don't have a direct connection to the original source. Because of this, when a news organization needs to fact check a story, they often can't dig enough to get the story's real origin. Absolutely... somthing. It's supposed to be a way to break the will of your enemies and (hopefully) bring peace. I know I'm likely going to get a lot of negative comments on this, but I want to make it clear that I am NOT suggesting that we start or encourage wars, but when war is brought to us, we need to be able to bring our fists and end the fight with no holds barred. Right now, most of the civilized world follows The Geneva Conventions, which sets limits on how countries engage in wars. It sets clear guidelines about what is allowed, and what is not, so that civilians and non-military targets are preserved. Why Does The Media Only Apply Labels To Conservatives? Have you ever noticed that the media only applies labels when they're quoting a conservative? I find it interesting that whenever somebody quotes a Republican or Conservative they always preface it with a "Conservative" label. It's almost as if they're putting out a disclaimer say "attention people... this is coming from a wacko conservative". For example, if Sean Hannity or Rush Limbaugh say something, the news will always say something like "Conservative Host Sean Hannity said XYZ", instead of simply saying "Sean Hannity said XYZ". I hate the fact that I know the name of the guy who killed John Lennon. Like a lot of people, I cried when I heard that somebody killed John Lennon. Within 24 hours, the name of the killer was plastered all over every single media outlet. Before he shot John Lennon, he was virtually unknown. The next day, his name was nearly as famous as the man he killed. That's just plain wrong. 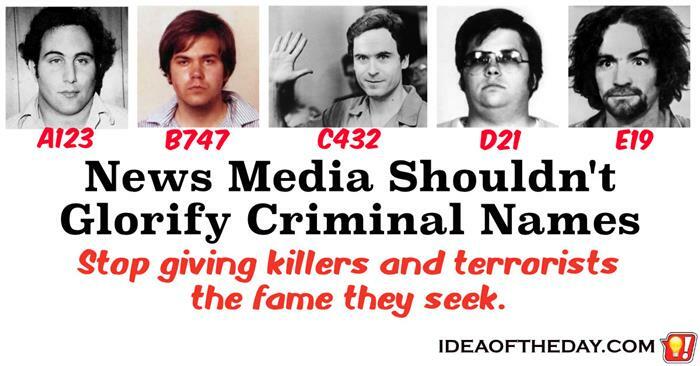 History books are full of the names of people who are famous just because of their crimes, including the guy who shot Ronald Reagan specifically because he wanted to be famous. That's sick. He got what he wanted. History has a tendency to be re-written, so why not experience it as it was originally reported? As Walter Cronkite used to say, "And that's the way it is."... or shall I say "was". Newscasts have one thing in common, they're only aired once. After all, they're supposed to be as current as possible, so who would want to hear about yesterday's news? Probably nobody, but if you fast forward a few years, and those newscasts are now called "History", or Primary Source History to be more precise. 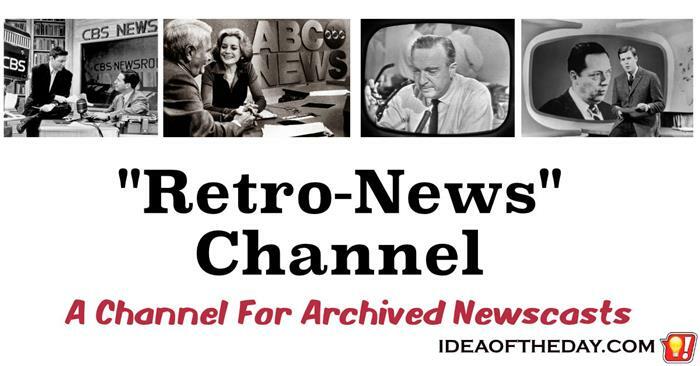 A Retro-News Channel would be different from a traditional news channel in that it would present history as it actually unfolded.